A Replica Of The David Staue Outside The Palazzo Vecchio In Florence, Italy. David Is A Masterpiece Of Renaissance Sculpture Created In Marble Between 1501 And 1504 By The Italian Artist Michelangelo. Lizenzfreie Fotos, Bilder Und Stock Fotografie. Image 111725980. 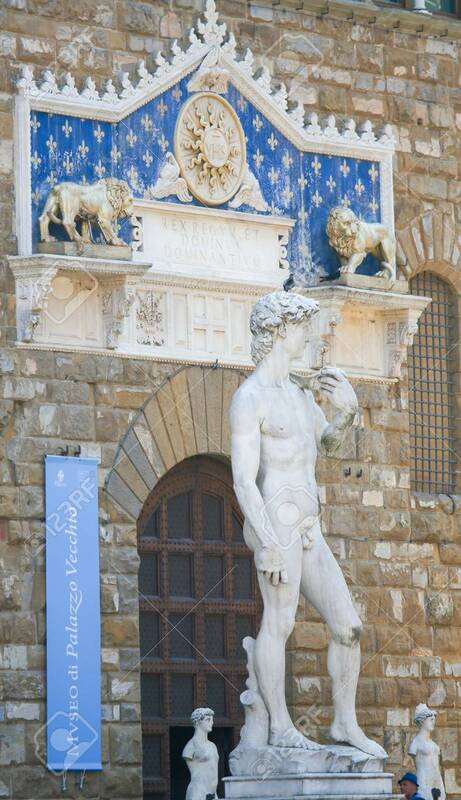 Standard-Bild - A replica of the David staue outside the Palazzo Vecchio in Florence, Italy. David is a masterpiece of Renaissance sculpture created in marble between 1501 and 1504 by the Italian artist Michelangelo. A replica of the David staue outside the Palazzo Vecchio in Florence, Italy. David is a masterpiece of Renaissance sculpture created in marble between 1501 and 1504 by the Italian artist Michelangelo.